Considering they have spent the majority of their recent history in the top-flight, it might be a little surprising that Southampton Football Club only have a single major honor to their name – the 1976 FA Cup. Nonetheless, their colorful tradition and the number of great players who wore their shirts make Southampton a household name of English football. The club's youth academy is renowned for consistently producing top talent and affording them the maximum opportunity for growth. The team in the season 1901-1902. The club was formed in 1885 by members of the St. Mary's Church. The church-based roots are still a big part of the club's identity, as evidenced by their most popular nickname – The Saints. Upon winning the Southern League in 1897, the club changed its name to Southampton Football Club. A year later, they moved to The Dell, a stadium which would be their home for the next century. Southampton followed up the 1897 Southern League victory by claiming five more titles in 1898, 1899, 1901, 1903 and 1904. During this period, they also made two FA Cup finals; however, Bury and Sheffield United would prove to be superior competition. They would finally join the Third Division of the Football League in 1920, advancing to the Second Division the very next season. 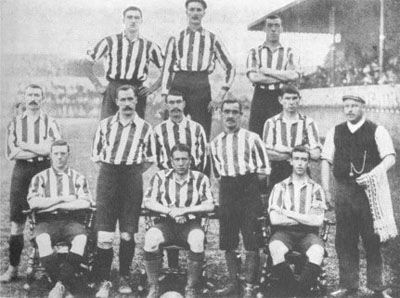 In 1904, Southampton become the first British football club to make a South American tour. In these days, the British game was far more developed than that in South America. Southampton would start the tour in Argentine and in a succession of matches winning by a combined score of 29-4 before beating a Uruguayan mixed eleven by 8 to 1. It took Southampton until 1966 to reach the First Division, where they remained for the next eight years. The top-flight gave the club their first taste of European football, with a couple of unsuccessful forays into the Inter-Cities Fairs Cup and the UEFA Cup. But their finest moment came in 1976, two years after being relegated; in the FA Cup final, Southampton shocked the overwhelming favorite Manchester United 1-0 to grab the first major trophy in their history. They would almost claim a Football League Cup title as well three years later, but lost against Nottingham Forest. The club's second top-flight campaign (1978-2005) would have far more longevity. Even though they did finish as runners-up to Liverpool in 1984, the clubs best result in the top league, most of this period was spent fighting to avoid another relegation. They stayed up mostly thanks to Matt Le Tissier, a gifted forward whose technical skills and loyalty to the club would make him the most beloved and influential player in Southampton's history. Le Tissier spent his entire professional career in Southampton, scoring 161 goals in 456 appearances. Following another FA Cup final loss in 2003 and a relegation to League One in 2009, the club was surrounded with numerous financial difficulties. Their fortunes took, however, a turn for the better after the club was bought by businessman Markus Liebherr in 2010. It took Southampton only two years to return to the Premier League. The first version of the current logo was design in the 1970s – until that the club has used the same logo as the city. In the 1990s the logo was modified. The dominating parts of the logo is a halo at the top (corresponding with the teams nickname, “Saints”), a red and white scarf plus, a crest and a banner at the bottom.